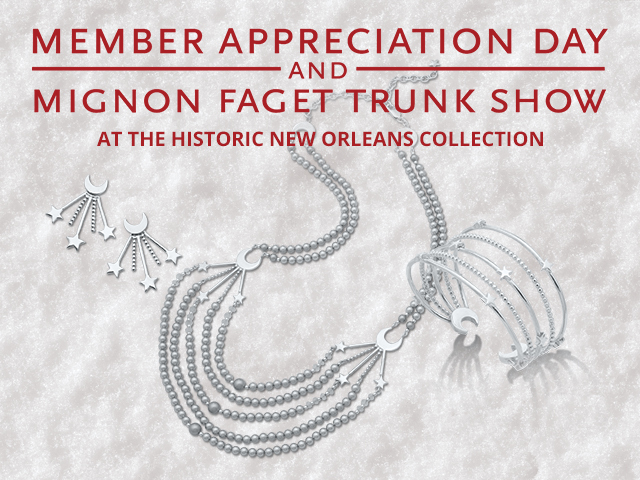 Member Appreciation Day: 9:30 a.m.–4:30 p.m.
Mignon Faget Trunk Show: 9:30 a.m.–4 p.m.
Join us Saturday, December 9, for Member Appreciation Day, 9:30 a.m.–4:30 p.m., when current THNOC members will save 20% on all in-store purchases at The Shop at The Collection. The one-day deal will also apply to merchandise from the Mignon Faget Trunk Show, which will be happening 9:30 a.m.–4 p.m.
Our shelves are bursting with holiday favorites and new exclusive merchandise. Plus we have jewelry and glassware by Mignon Faget, Ltd., including the new Crescent Collection, and pieces by John Humphries Designs. New memberships or renewals are available on site or in advance online or by calling (504) 598-7109. Gift memberships are also available this holiday season. Order by Monday, December 11, to ensure holiday delivery. Member discounts may not be applied to the purchase of gift memberships or gift cards.